BANGOR, Maine — After 12 years with the football program, Nat Clark was named the new head coach of the Eagles. Clark spoke on Monday afternoon, becoming emotional when thanking former head coach, Gabby Price. 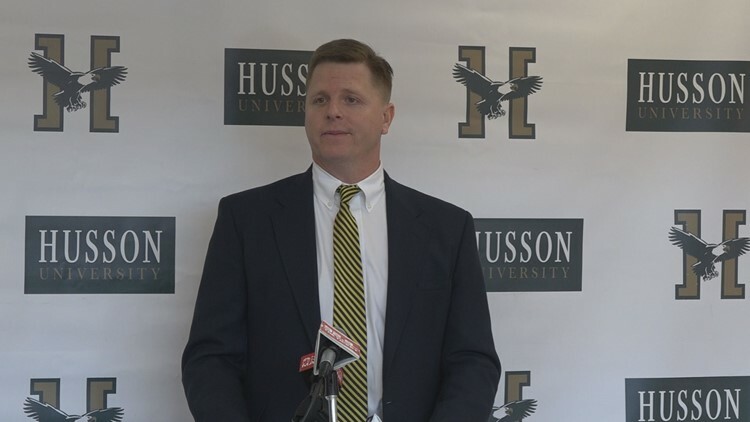 "This will be a tough one, Coach Price," Clark said "words cannot express how grateful I am and how much I appreciate the opportunity to work with Coach Price and be on his staff at Husson and at Bangor High. He built this program and I'm honored to follow in his footsteps." The Eagles are joining the Commonwealth Coast Conference and with a new conference, comes new challenges. "As we move forward we will do so with the same philosophy we've been building here for years. It's about the relationship with our players, each and every day. Support them in any way we can." Clark said. "As Bill Belichick said last night, it's all about the players.," he added. Clark will remain the offensive line coach and the players on the line are excited for that. "He's the fire behind us. He gets us ready for every single week," sophomore Jacob Cameron said.